San Pedro Police are investigating an explosion that occurred at a residence in the San Mateo Subdivision last night, just north of the Sir Barry Bowen Bridge. Reports are that an unidentified explosive device was hurled into the yard of a residence while its occupants were getting ready to sleep. No one was injured and police have detained two minors for questioning. Bomb experts from the Belize Defence Force are currently in San Pedro town investigating an explosion which occured last night. Initial investigations reveal that at around 8:00 p.m., Saturday night, an explosion occurred at the residence of Amancia Martinez, 39, in the San Mateo area of the island. Police say that when they visited the scene, they observed a hole in the ground beneath the steps, as well as holes in the first and second steps of the house. Martinez told investigators that she was inside her house when she heard a loud bang and felt her house shake. Residents told police they saw two youths fleeing the scene after they threw an object inside the yard. Police and BDF officials are currently investigating the incident. On Saturday 16th September 2017 about 8:20pm acting on information received of an explosion in the San Mateo Area, San Pedro Police personnel visited the residence of Amancia Martinez 39 years old Hair Braider of San Mateo Area, San Pedro Town where they observe a hole in the ground beneath the steps of the house and mud splatter on top of the steps and what appears to be holes in the first and second steps. Amancia Martinez reported that about 8:20 pm whilst inside her house, she heard a loud bang and felt the house shake. After a while she went outside to inquire what had happened. Initial investigation revealed that two male persons were seen throwing an object in Amancia Martinez yard and then ran off. BDF bomb expert is assisting the police in the Investigation. And from the tragic story of that apparent murder/suicide, we take you now to San Pedro Town, where a grenade and exploded in a residential community on the island. 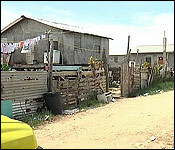 The dangerous explosive was thrown in the yard of a family, located in San Mateo, one of the poor communities on the outskirts of the busy downtown area. On Saturday night, the loud blast of its explosion was heard about a mile away, alarming residents. At the yard where the grenade was thrown, it tore a hole in the ground under the house which was on stilts, sending shrapnel into the bathroom. This San Mateo home looked calm today, but on Saturday night, it was the scene of an explosion from a grenade that was thrown in the yard. Residents tell us that although San Mateo is on the outskirts of the town, residents nearer to the downtown area were able to hear the explosion. "There was also an explosion at a residence in the San Mateo area of San Pedro Town. Upon police responding to the area, a large hole was seen beneath the step of a wooden structure that is elevated off the ground. 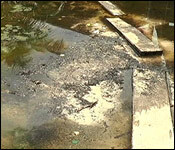 Also mud was seen on the steps and other damages to the area. Police have since detained 3 persons in connection with this investigation which continues." It exploded here at the foot of these steps. Fortunately, nobody was hurt, and the family was not at home at the time. "I have a small family. So, it's just that, nobody was really at home at the time. So then, it's not really any threat, but still, the problem is they are coming to my yard, bringing problem to, throwing bomb in my yard. Nobody was really at home, so nobody would have gotten hurt." Still, someone threw it pretty much at their doorstep, a threat that this gentleman immediately realizes. "The situation is that they can now see that they can come all the way to yard, all the way behind - all the way across the bridge - all the way over here to come bring problems to us, you understand?" 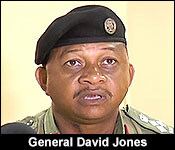 The leading local explosives expert, General David Jones, says that he has determined the make and the model. 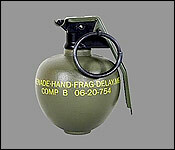 From his assessment, the explosive thrown at this family's home was a US M67 fragmentation grenade, one like this. "I went out to the area afterwards where when I visited the area I saw the crater at the bottom of the steps and after inspection of what occurred, I realize definitely it was a high explosive fragmentation grenade. It's first for San Pedro. In the over 20 years I've been in the Force, I haven't heard of a grenade being used in San Pedro, but it was definitely a high explosive grenade, caused some damages to the steps. Some of the fragments went through the house that was about 15 meters away - it went through the bathroom. The houses in the adjacent area were all shaken. The other parts of the grenade that I am looking for hasn't been found, but based on what I've seen there, its definitely a US type grenade that has a steel body that is designed to fragment in detonation and that's the type of grenade that was used in San Pedro"
"The radius for lethal would have been within 5 meters. If anybody was within 5 meters of that grenade when it exploded it would have killed them. It would have caused serious casualties if anyone was within 15 meters. But this type of grenade can cause injuries up to about 230 meters away, because the secondary effect from that grenade is the fragments that comes from the body. It has the primary effect which was felt by the residence around there which is the shock wave from the explosives. That went out for a long distance away. It could be felt. But the secondary effect of the shrapnel itself could have gone out to 230 meters. It was in an enclosed area. Fortunately no one was around the immediate area when the grenade exploded, so 5 meters radius - lethal. 15 meters - serious casualties." "You know, General, it's not really about the situation that's happening with gangs or what's not. It's just the police. They know who is really doing this, and they came back here, this area at San Mateo. They came to our house. They came to kick down our door. They came to hurt all of at the back here. Well, me especially, they took me like a target, you understand? And we are tired of that. They came and threw a bomb at my yard. Several times they came to fire shots at my yard. People - we have to defend ourselves, but we are no bad people. And the, the law doesn't understand that. Like they came and threw a grenade at my yard. Now, Jemmoth came, sent the GSU." "Now, they took away my boat, and then he is always saying that we are the bad people, you understand, general, when lots of people are bad minding us, and they are causing problem, and they watch us as the bad people. They are not watching what those young boys are doing." 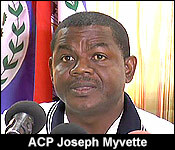 The head of the National Criminal Investigations Branch believes that the tough police response is an attempt to contain the public threat to safety that this explosion is, while getting to the bottom of it. "Their suggestion is that the initial police response was to treat them like they were suspects when they were the victims of this particular attack." "I believe that the officers or the first responders would have been securing the area and looking for suspects, hence the reason that would have been so." "These type of weapon is not supposed to be in the urban area, it's not to be in the hands of civilians. Grenades are designed for war time scenario. Starting off in World War 1 was trench warfare, where they should post them inside a trench to injure or kill people or if you are being overrun by a number of enemy forces you throw it in the open for it to cut them down. It's not supposed to be in urban area and in particular San Pedro which is a tourist area. You wouldn't want such a weapon to be in those urban setting." And a quick clarification, you heard the young man tell us off camera that none of the members of his family were not at home when the grenade exploded. Well, A police report, sent this weekend said, quote, "Amancia Martinez reported that about 8:20 pm whilst inside her house, she heard a loud bang and felt the house shake. After a while she went outside to inquire what had happened." Amancia Martinez is our interviewee's mother. Police say that they have 3 persons detained for question. The cops add that 2 men were seen throwing the grenade in the yard, after which they ran off. Later on in the news, we'll show you what the police have say about this 4th explosive to have been brought to public attention this month.